Away from the hustle and bustle of modern life, this living history village is in Gosport, a short ferry ride across Portsmouth’s busy harbour. It’s where you can meet and talk with the “villagers” dressed in period costumes and watch them demonstrate the historic skills of the blacksmith, lace-makers and weavers from 17th century England. When a great relative of Pocahontas came to the village, she shed tears because the village looked so much like what her ancestor had lived in. There’s a fascination with the way our ancestors built their houses, the animals they kept and how they raised them and the crops they grew and how they used them in everyday life. 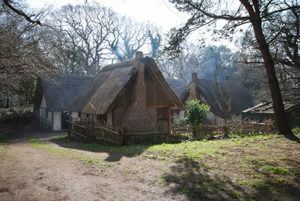 Set in a beautiful 40-acre site, the open-air museum brings to life the stories of the people who lived and worked in them over a 950-year period ­ from Anglo-Saxon to Edwardian times. 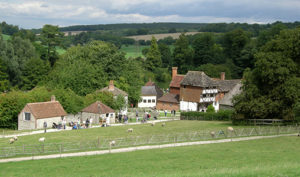 Exhibits include a medieval farmstead, a working 17th century watermill producing wholemeal stoneground flour, exhibitions of traditional building techniques and agriculture, a working Tudor kitchen, historic gardens and farm animals. Special countryside events are regularly held throughout the year. This experimental archaeology site, nestled in the South Downs National Park is complete with reconstructions of ancient buildings from the Stone Age, Iron Age, Roman Britain and the Anglo-Saxon period. 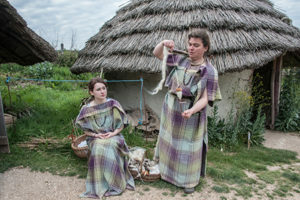 They grow ancient crops, maintain rare breeds of animals and offer tours that give a comprehensive overview of the farm along with optional hands-on activities like bronze casting, flint knapping, jewellery making, fire lighting and cookery. Fishbourne Roman Palace is a First-century home and archaeological site with the largest collection of early Roman mosaic floors in Britain. In its time, the lavish residence would have been fit for a king and the recreated Roman garden, the earliest found anywhere in the country has been carefully replanted to its original plan with box hedging and staked espalier fruit trees. With a pint of Orchard Thieves cider or Flowerpots IPA and lunch today in an ancient waterside inn, the rest of the afternoon should include a visit to Holy Trinity Church in Bosham. It’s been a place of Christian worship for over 1000 years and in the opening panel of the Bayeux Tapestry, it shows a meeting between Harold and Edward the Confessor at Bosham church in 1064. Check it out when you see it in Normandy, France or at some point this summer when it’s being exhibited in London. Finish the day with a visit to Chichester Cathedral, famous for its contemporary art works and stay on for Choral Evensong. If you have clients travelling in southern England between 31st May – 2nd June, they might like to know that this majestic nine-hundred-year-old Cathedral will be transformed with over eighty stunning floral arrangements all following the theme of the Festival’s title ‘This Earthly Paradise’. Paull Tickner, owner of U.K.-based Custom GB, is known for his expertise in creating and operating imaginative, value-added tours of Great Britain and Ireland. Visit his website at www.customgb.co.uk and email him at ptickner@customgb.co.uk.